Dualit's elegant Cafetière is easy to use and due to its patented double filter, leaves you with a smoother cup of coffee. The double walled insulation retains heat and the mirrored, cool touch, stainless steel finish and sleek, curved body ensures this is a cafetière that would add grace to any table. With a stylish, polished, stainless steel body the Cafetiere features double walled insulation to keep coffee hotter for longer, making it a great choice to bring to the dinner table or for those lazy weekend mornings when you don't want the coffee to end! With a saving of 20% for a limited time, now is the time to treat yourself. The patented double filter features both a coarse mesh layer and fine mesh layer, so even the finest of grains are removed and sediment is reduced by up to 22% compared to traditional, single filter cafetiéres. The cafetiére's double walled insulation ensures your coffee or tea stays fresh and hot; at optimum brewing temperature (90-96°) for four minutes and remaining up to 18% hotter than in conventional, glass cafetiéres. 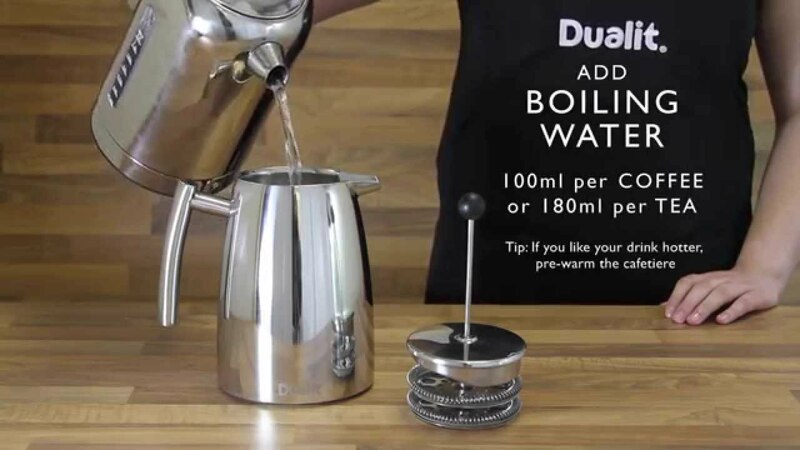 In true Dualit style the cafetiere is built to last; made from high-quality, durable stainless steel, it will not shatter and is tough enough to withstand the many bumps and knocks that years of use can bring. NX® Coffee Capsules: Buy with your weekly shop! For the ultimate convenience buy Dualit NX® coffee capsules with your weekly shop!